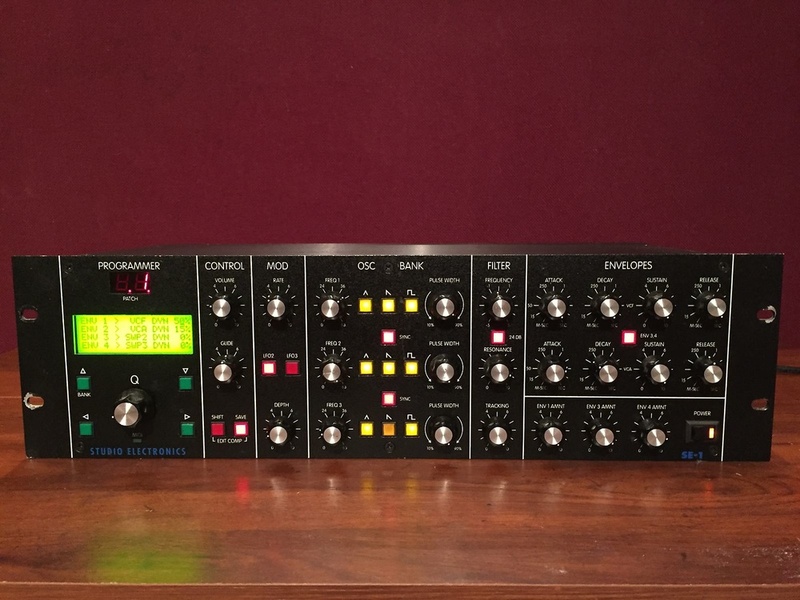 Studio Electronics SE1 monosynth (photo courtesy of Matrixsynth website). In an age of ever‑growing polyphony, Studio Electronics, best known for their vintage synth rebuilds, have returned to first principles — to create the first analogue monosynth for almost a decade. So how does this MIDI‑equipped modern classic measure up to its vintage forbears? This is quite a special review for me, as it announces the release of perhaps the first new, monophonic, analogue synthesizer since 1984, if my sources of information are correct. Despite the fact that we are constantly being told that analogue synths are too expensive to build, Studio Electronics have gone ahead and built one anyway. And a very appealing piece of kit it is, too. Firstly, a brief background to the existence of the SE1. Based in Encino, California, Studio Electronics have of late made a name for themselves by stripping down customers' existing analogue keyboard instruments and racking them up, fully MIDI retrofitted, at a not inconsiderable price. Perhaps the two most well‑known examples of this practice are the P5 Prophet rack (an erstwhile Prophet 5 keyboard in a box) and the MIDImoog, (that quintessential monophonic synth, the Minimoog) similarly repackaged. However, these are merely custom modifications, not new instruments, and we have to look back in time perhaps as far as 1984 to find the last newly‑produced analogue monosynth, the Yamaha CS01. Even this is cheating; the CS01 was actually re‑issued in '84, having first been released in '82. Also in 1982 we find the Roland SH101, which was kept company by the Siel Monosynth and followed in 1983 by Sequential's Pro One and Crumar's Spirit. The dates attached to these examples make it clear how remarkable the appearance of a new analogue synth is in 1993/4, 10 years down the line of digital progress. The SE1 has been physically designed from scratch, whilst borrowing the sound and expanding upon the synthesis architecture of that most venerable of synths, the aforementioned Minimoog. The main purpose in life of the SE1, it would seem, is to do everything the Mini could do, under MIDI control, without any of the tuning problems associated with the original instrument. This is achieved due to Studio Electronics licensing of Moog filters, oscillators and VCA. What you hear from the SE1 are the real things — and Robert Moog was apparently on hand to make sure things turned out as intended. The tuning is, of course, monitored digitally in software, implying that this synth is in fact a hybrid; analogue sound under digital control. One look at this synth and its ancestry is clear. The layout of its controls and even the knobs shout "Moog" immediately. It's presented in a 3U high, 19‑inch rackmounting box that is incredibly light — I don't possess any bathroom scales, but I'd be surprised if it weighed in at more than 4lbs/2Kgs. Anyone who remembers carrying a Minimoog will wonder how such a weight reduction is possible. Due to the similarities involved, it is worth regular comparison of the SE1 with the Mini, even though in‑depth examination of the new instrument reveals that it is actually comparable to larger Moog modular systems. This is because of the additional modulation and routing options available that go beyond the basic functions of the Minimoog. 12dB and 24dB per octave filters. Four ADSR envelopes (two of which are assignable to various functions). Principal editing functions exist as hardware knobs on the front panel, and secondary editing and routing functions can be found in software. All software editing is performed using an integral large, backlit LCD screen, a rotary encoder, and cursor up/down/left/right buttons. These controls and the screen are at the left hand end of the front panel, with the remaining panel space being occupied by the hardware controls. The panel layout is very similar to the Minimoog's, with the controls laid out left to right roughly in the order of the signal flow. I must now find my wooden spoon and mention that the review model had only one sound programmed at location number 1. The other 98 locations were empty. I sincerely hope this will not change; one day, all synths will be made this way. Indeed, there is no excuse for not getting right down to some serious sound creation here. Editing is entirely self‑explanatory, and the only visits to the manual were for clarification of one or two cryptic abbreviations in the display — for example, assigning something to SWP2 or SWP3 actually means the frequency of oscillator 2 or 3. Obvious, no? No. Don't panic, this is an isolated case of gobbledegook. Of the 24 hardware controls, only four (when turned) will invoke an edit page to appear in the LCD screen. Three of these are the frequency controls of the three oscillators (thereby giving on‑screen access to the fine tuning of each and the main tuning of the whole instrument) and the fourth knob (glide time control) calls up the edit page where the glide on/off switch is to be found. Otherwise, the 20 remaining controls are set purely by ear. That's right; no display of any values whatsoever... you simply twiddle and listen. (Gosh, I remember that!) This includes the rate and depth of the three LFOs, the pulse width of all the oscillators, the filter and all the envelope controls. All the remaining parameters are edited on the LCD on one of eight edit pages, accessed by holding the shift button while turning the encoder or pressing either the left or right cursor button. Easy enough; there are no layered or hidden menus to contend with. The time has now arrived to look at each section of the SE1 in turn, and draw comparisons, where appropriate, with the Minimoog. Unlike the Minimoog, which sports six fixed waveforms per oscillator, the SE1 has three; triangle, saw and pulse, selected via illuminating buttons. The ante is upped, though, when we discover the pulse wave to be continously variable, a feature not found on the Mini. As such, these oscillators have possibly more in common with the polyphonic Memorymoog. And, like the Memorymoog, these three waves can be combined to further increase the number of waveforms possible. The oscillators are each stepped in semitones over a 5‑octave range. The fine tuning range is just over a semitone (+63/‑64) which, by my calculations, brings each increment in at about 0.8 of a cent, which is surely fine enough for any application. Not only can oscillator two be synched to oscillator one, but oscillator three can also be synched to oscillator one. Oscillator sync, for those of you not familiar with the term, is a process whereby the frequency of one oscillator is hard synchronised to the frequency of another. Changing the frequency of the synched oscillator produces gut‑wrenching timbral changes of an altogether dramatic nature. Many new waveforms can be made in this way. The 24dB per octave resonant filter "is built around the authentic circuitry of the Minimoog", explains the manual. Not only that, but another illuminating switch selects between either 24dB per octave or 12dB per octave filtering. The 12dB per octave filter is interesting, being culled from the Oberheim SEM monosynth. The tonal difference between these two filters is quite dramatic, particularly affecting the way the resonance sounds. The filter's keyboard tracking (the brightness of sound depending on keyboard position) is also continuously variable, a step up from the Minimoog's four fixed settings. The settings for relative volumes of the oscillators is found on the third software edit page. As well as the three pitched oscillators, we also find the control for White Noise level, and also Ring Mod level, the equivalent of the Modulation Mix knob on a Minimoog. This Ring Modulation is derived from the multiplied pitches of oscillators 2 and 3, and the mix levels of these oscillators can be turned down if it is desirable to hear the ring‑modulated effect in isolation. The standard arrangement vis a vis envelopes is usually a pair of ADSRs (attack, decay, sustain, release); one for the filter (often generating other modulation functions as well) and one for the amplifier. The SE1 has no less than four envelopes. Envelope 1 is permanently assigned to the filter, Envelope 2 is assigned to the amplifier, and Envelopes 3 and 4 can be assigned to a variety of destinations (see side panel for modulation possibilities). The upshot of this is that special sweeping effects can take place at their own pace (having their own envelope) without compromising the filter and amplifier settings. For example, assigning Envelope 3 to the frequency of oscillator 2, whilst synching oscillator 2 to oscillator 1, means you can have a really slow sync sweep happening over a sound with a relatively snappy filter envelope. Since all four envelopes will respond to MIDI velocity to a programmable percentage, this sweep could therefore be under velocity control. In addition, since Ring Modulation is also a definable destination for Envelope 3 or 4, it follows that the mix of the Ring Mod within a sound can be controlled by velocity, and/or given its own envelope curve. As there are only two sets of ADSR controls on the panel, an illuminating red switch toggles between Envelope pairs 1 & 2, or 3 & 4. To round off this section, there are overall depth controls for envelopes 1, 3 and 4. This is a notable departure from Minimoog design. On that instrument, low frequency oscillation (and Ring Modulation) are produced by pressing Oscillator 3 into service as a means of modulating the pitch of the other two. In the case of the LFO, this meant losing oscillator 3 as an audio source. Not so on the SE1, where three totally independent LFOs are available to modulate a variety of destinations. Rates and depths are adjustable from the front panel, while waveforms and destinations are set on LCD screen page 5 (see 'LFO & Envelope Routings' box for details). Sadly, on the review model, none of the destinations would function, nor could I change the LFOs' waveforms; only LFO 1 appeared to work, modulating all three oscillators with a triangle wave. The manufacturers seem to be aware of the fact that certain functions are not yet implemented and updates are duly promised. At this stage of the SE1's development, the MIDI spec is fairly basic. What's there works well enough, and is simply a matter of channel number selection and initiating data dumps. At present, no real‑time SysEx info is generated at the MIDI output, but this may well follow. Currently, the SE1 responds to note, bender, modulation, volume and program change messages, and the manual promises many additions, such as aftertouch, and two assignable controllers (breath control, please!). Other features, such as envelope inversion, a choice of LPF or HPF for the 12dB filter, global octave transpose, even memory protect (bless 'em!) are all a software update away, say Studio Electronics. Such a shame these things aren't working before the SE1 hits the shops. Time to finally answer that question: yes, it sounds like one. My own Minimoog (a late model) was extracted from its cosy case and set up beside the SE1. Tonally, they were like peas in a pod. If there was any discernible difference, aside from the SE1's unnervingly stable tuning, it was in the character of the envelopes — the difference between a purely voltage controlled phenomenon and one under digital supervision. Some analogue envelope generators seem to have the edge on speed over their digital counterparts. Studio Electronics are offering a choice of linear or exponential envelope curves within a future update, enabling users to switch into 'ARP Odyssey mode', thus further expanding the potential of this excellent box. As regards the sound in a practical situation; almost immediately after it was delivered, I used the SE1 for the lead instrument role in an on‑going mix. It sat in the mix with a real presence and authority that nothing else in the studio had quite equalled. It left me in no doubt as to why the generation of synths which spawned the Minimoog and its ilk is still so highly regarded. Well, I never did MIDI my Mini, and I'd prefer to keep it in its original state rather than have it repackaged. Besides, the damn thing never did stay in tune. At least, that's one line of reasoning I could employ to sell myself an SE1. Quite apart from that, it sounds great, and should win many fans. Cost is one factor most likely to make any potential buyer hesitate. Some people may also prefer to wait till the software has got past puberty, so to speak. It seems that although analogue synths may not after all be too expensive to make, they're still not cheap to buy. The price of the SE1 is, however, quite competitive with the MIDImoog alternative, and you get one hell of a lot more synth for your money into the bargain. For anyone thinking of investing their money in this area, the SE1 is worthy of instant investigation and very large chunky bits of your serious attention. The true sound of a Minimoog. Some important functions not yet implemented. A Minimoog for the '90s — without the weight and the tuning problems, and capable of more than the original. Even at £1295, competitive with the cost of a mint Minimoog with MIDI, or a rebuilt rack version.